James Robson, Aristophanes: an introduction. London: Duckworth, 2009. xi, 244 p.
Recension par Anna Peterson (Ohio State University) dans Bryn Mawr Classical Review 2010.08.67. This accessible introduction to the work of one of the world'sgreatest comic writers tackles key questions posed by Aristophanes'plays, such as staging, humour, songs, obscene language, politics andthe modern translation and performance of Aristophanic comedy. Thebook opens up exciting and contentious areas of Aristophanicscholarship in a way that is engaging and readily comprehensible to anon-specialist audience, never losing sight of the fact thatAristophanes' plays are vibrant literary texts, designed primarily toappeal to a classical Athenian audience as pieces of living drama. 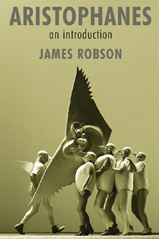 Keyto the book's appeal is that James Robson conceives of the plays asdynamic texts, containing a treasure trove of information not onlyabout how they might have been performed and received in classicalAthens, but also how they might be read and understood today. Mostimportantly, readers are given the tools and information to make theirown minds up about the debates that still rage about Aristophaniccomedy in the modern world. James Robson is Senior Lecturer in Classical Studies at the Open University, and the author of Humour, Obscenity and Aristophanes (2006).